A few weeks ago we met with ASRock Rack in Taipei, Taiwan and mentioned we had many users excited about their Intel Atom C3000 (Denverton) based products. At Supercomputing 2017 in Denver, Colorado, the company had a number of products on display. One example was an updated version of the ASRock Rack 3U8G-C612 8-Way GPU Server that supports Intel Xeon Scalable (Skylake-SP) CPUs as well as an updated cooling design. 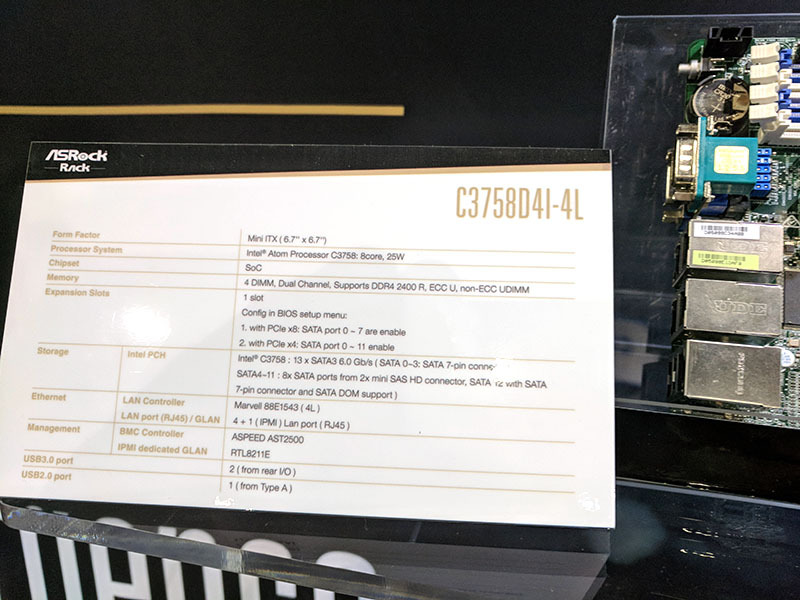 While that was clearly the target of the show, along with 2U 4-node units, we saw two motherboards at the back of their booth that are particularly interesting. 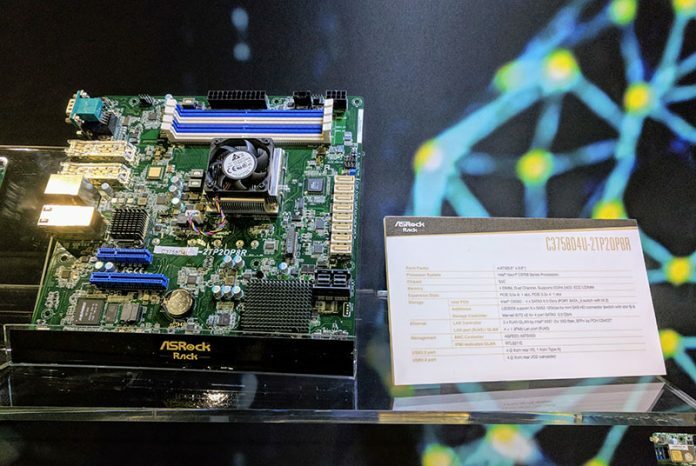 We previously covered the ASRock Rack C3000D4 Series Embedded Motherboards Announcement at the release of the new Atom chips. This is the first show where we have seen PCB shown off publicly. 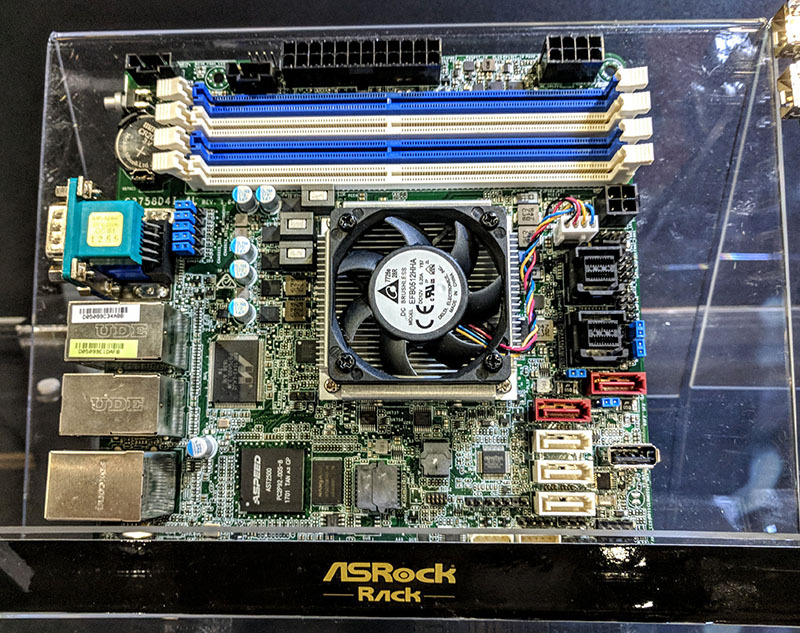 The first motherboard we saw was the ASRock Rack C3758D4I-4L. The ASRock Rack C3758D4I-4L is the successor to the ASRock Rack C2750D4I Storage Platform we reviewed about four years ago in 2013. That platform was extremely popular and it found design wins in solutions such as the FreeNAS Mini. We snapped the spec sheet because it is extremely interesting. First, it utilizes only 1GbE networking and an 8-core Intel Atom C3758 SoC. Second, it does not have PCIe slots. There is no expansion m.2 slot. Instead, ASRock Rack is focusing on providing a large number of SATA III ports (13 total, two with SATA DOM support.) That is an extremely bold design and also one that lowers BOM costs considerably while maintaining 4x DDR4 DIMM slots. 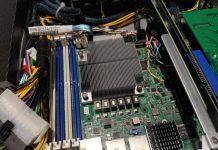 The other board that caught our eye was the ASRock Rack C3758D4U-2TP2OP8R. This motherboard is on the other end of the spectrum. For those wondering what they are seeing, the ASRock Rack C3758 is essentially the Atom incarnation of the ASRock Rack D1540D4U-2T8R full featured Xeon D platform. It has two 10Gbase-T and two SFP+ ports for networking. There are two PCIe expansion slots, a m.2 (SATA) header. There are eight SATA III ports and two SFF-8643 headers for another 8x SAS3/ SATA III ports. This is the first version of the ASRock Rack C3000D4U-2TP2OP8R platform that we had a picture but no specs of at launch. With the Intel Atom C3000 series it is relatively easy for vendors to customize motherboards to have different SoC’s onboard depending on what system builders want. 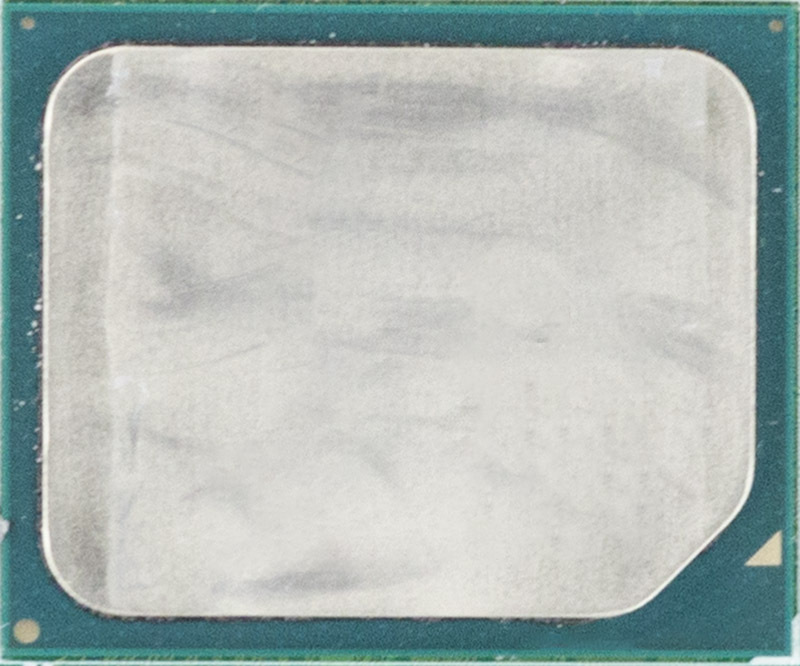 The Intel Atom C3000 series production chips just hit vendors mid-September 2017 so we are hoping to see more offerings in the market as time passes. We requested samples when we were in Taipei a few weeks ago so stay tuned to STH. Does anybody know when these ASRock Rack C3000 motherboards are available for sale? The C3758D4U 2TP2OP8R is exactly the board I am looking for and as of November 2018, the board is still not listed on the ASRock site, not for sale, etc. The closest thing out there is the D1541-version of the board. Do you have any idea when the C3758D4U 2TP2OP8R might actually see the light of day?